Although SMS (or text message) marketing hasn't received the hype or fan fare that of mobile applications, for many marketers it has proven to be the most reliable and effective use of mobile phone technology. Location-based technology for the mass market is an exciting new capability moving rapidly into the mainstream for mobile marketing and mobile engagement. 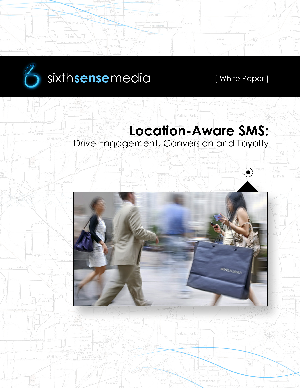 The advantages of using location information with SMS are enormous and providing uniquely personal, always-connected and location-sensitive access to content and communications. With hundreds of thousands of users signing up for Foursquare every week and Facebook now incorporating a location option into nearly everything a user does, having a location-based marketing strategy can not only increase customer loyalty and brand affinity but can also extend the reach of marketing messages.